With #1 spark plug removed, turn the engine over clockwise using the 3/4″ front crankshaft bolt. You will see the degree marks on your front cover and you will see the timing mark on the balancer. Mark them with chalk or white-out. While turning the engine over, put your finger/thumb over #1 spark plug hole. As the mark on the balancer approaches the marks on the front cover, if you are coming up on #1 TDC, pressure in the cylinder will push on your finger. If there’s no pressure, you’re at #6 TDC and need to crank the engine over until you see the marks coming together and you get pressure. Set the mark on the balancer to the 0 mark on the front cover. Another good way to find T D C, thanks! 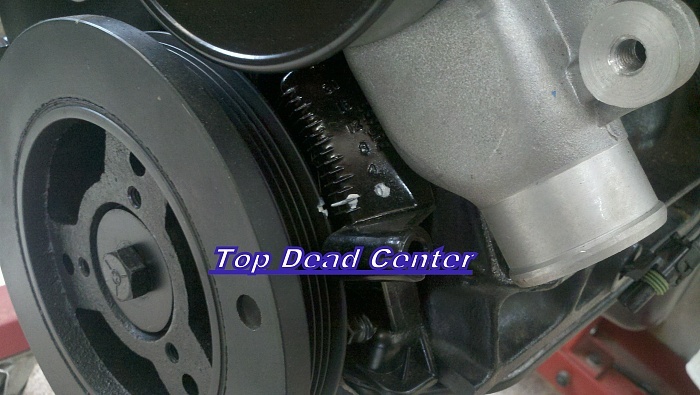 Top Dead Center, when the piston is all the way up on compression or exhaust stroke. So, what if your block has a different indicator scale on it? Mine is similar, but has a … tube about where your 0 (zero) is. Well I hope that tube/ hole is close enough to where the Zero is supposed to be. It will also have marks on it. Those are what you use. The hole was for a timing probe that wasn’t used for very long. What if I’m getting pressure and the mark on the balancer isnt visible? The outer ring of your balancer may have become delaminated.